Though Park Ex is home to a concentration of top Indian restaurants, there are gems throughout our fine city. And at each spot, there’s a signature dish that keeps foodies trekking crosstown again and again. 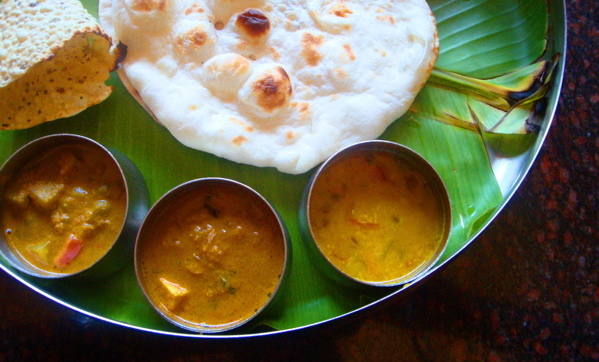 Here, Indian dishes worth a drive. India Beau Village makes chana samosa, aka Indian poutine: one roughly broken vegetarian samosa, doused in chick pea curry and topped with dabs of mint raita, plain yogurt and chopped red onion. $3.50. 752 Jarry St. W., 514-272-5847. Bombay Choupati, Pierrefonds’s strip-mall outpost, specializes in dosas, a Southern Indian burrito, with thin rice pancakes, not tortillas. The masala dosa is filled with a spicy potato and onion mash, while the fire dosa cranks it up with hot peppers and green chilis. From $4.95. 5011 Sources Blvd., 514-421-3130. Etoile des Indes’s beef Bangalore phal will surprise those of you who thought vindaloo was the height of Indian heat, and will leave you red, sweaty and vaguely euphoric. $8.95. 1806 St. Catherine St. W., 514-932-8330; 5860 Sherbrooke St. W., 514-484-9252. Bombay Mahal’s menu is pan-Indian, even venturing into Pakistani territory, and although this dish is available at every Indian joint under the sun, their butter chicken may be the city’s best. $9. 1001 Jean Talon St. W., 514-273-3331. Dev is somewhat under the radar and off the beaten path, but as its largely Indian clientele will tell you, dishes like chicken jalfrazi (“dry fry”) – a Desi stir-fry with onion, garlic, ginger, green peppers, tomatoes and spices – make it worth the trip. $8.49. 5987 Victoria Ave., 514-733-5353. For a true exquisite Indian “Haute Cuisine” ; try Restaurant Lal Kella in Châteauguay. The chef was previously at the famed “Sunam Tandoori” in Outremont ; worth the trip across the Mercier Bridge. 1001 Jean Talon – “Best” butter chicken in the city? Wow…Montreal has it rough. That butter chicken was yellow, flavourless, and over powered with spices. No quality what so ever. Yes, the basics were there, but it was HORRIBLE. Coming from Toronto where butter chicken is a plenty, this version from Montreal was HORRIBLE. Butter chicken is traditionally a mild dish. For those visiting Toronto, try Little India on Queen St W, that is a non-indian friendly butter chicken.